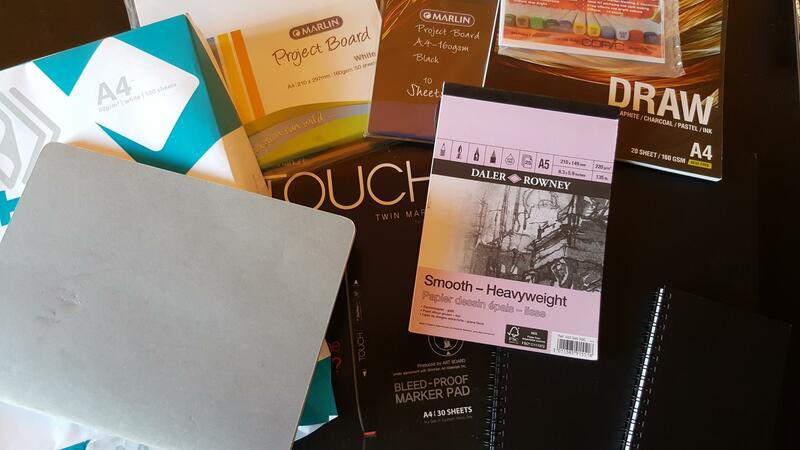 Here’s a selection of the papers I draw on. From left to right; 80gsm printer paper, a grey moleskine journal (a lot of illustrators use these but I don’t like drawing in them much because the paper’s very soft and the ink takes a fraction longer to dry, so I smudge things a lot), white and black 160gsm project board at the top (it’s just thin cardboard with a fine tooth), bleed-proof marker pad, smooth-heavyweight 220gsm (fine-nibbed technical pens work really nicely on this – as the tooth is so fine, the nibs don’t snag), Copic blending card (only useful if you’re going to be colouring in afterwards with blendable markers), 160gsm ‘Draw’ pad, and two ‘creative journals’ that contain 120gsm cartridge paper. There are no ‘right’ pens to use. That’s very important. It doesn’t matter what someone else used to draw something – it matters what you enjoy drawing with and what works best for you. 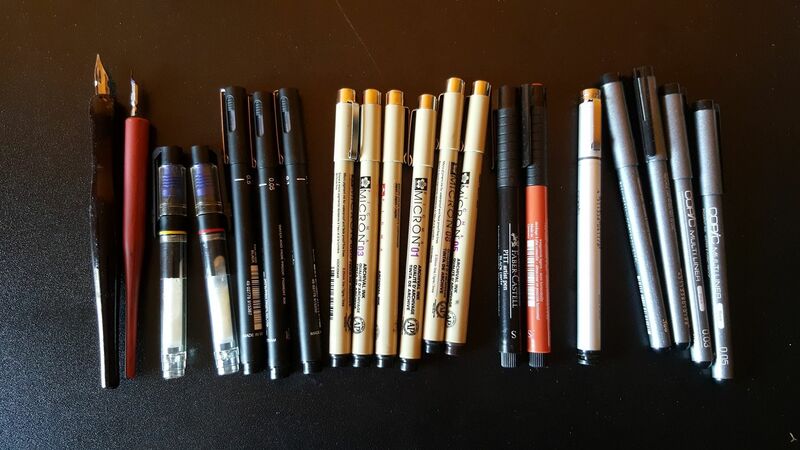 I have a variety of different types of pen and which ones I use for any piece depends on what mood I’m in. I find if I’ve enjoyed one kind for a while, I like changing to another kind for a bit. They all handle differently and feel different to draw with. I’ve also seen people do amazing things with ball point pens and Staedtler colouring fineliners – so don’t be afraid to just try something, and don’t think you have to splash out on expensive technical pens to be able to get good results! From left to right: Two calligraphy pens with interchangable nibs, two Aristo technical pens (also known as isograph pens, these are technical pens with refillable ink cartridges; they’re the ‘old school’ technical pens that artists (mainly architects, I believe) used before the advent of disposable technical pens), three UniPin pens in a variety of sizes, six Sakura Micron pens in black and sepia and in a variety of sizes, two Faber Castell Pitt pens, both in ‘S’ size, one in Sanguine; one Copic multiliner (the more expensive kind that have replacement nibs and are refillable), four Copic multiliners in various sizes (the cheaper disposable kind). 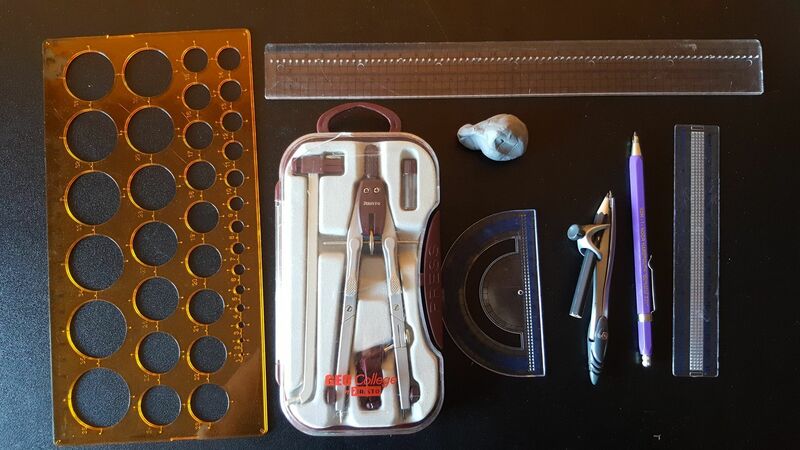 From right to left; a small ruler, mechanical pencil (use whichever kind of pencil you prefer), small compass, protractor, putty rubber, Aristo Geo College Rapid adjustable compass (has a bigger range, essential for drawing circles on bigger paper), circles template and a 30cm ruler at the top. 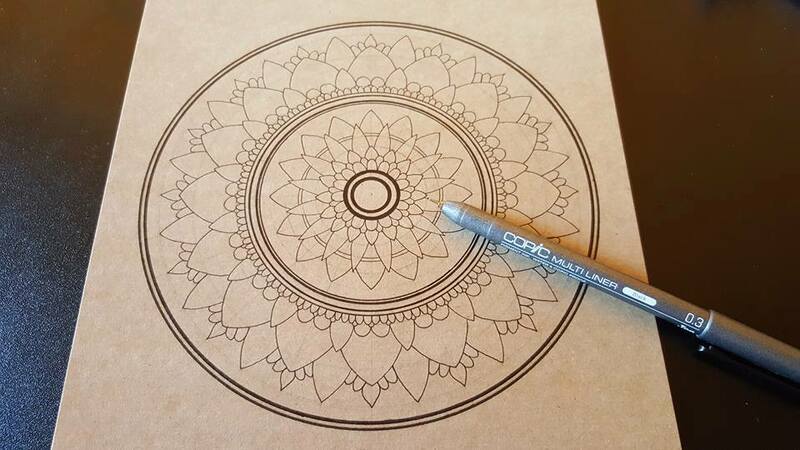 HOW CAN I GET STARTED DRAWING MANDALAS? 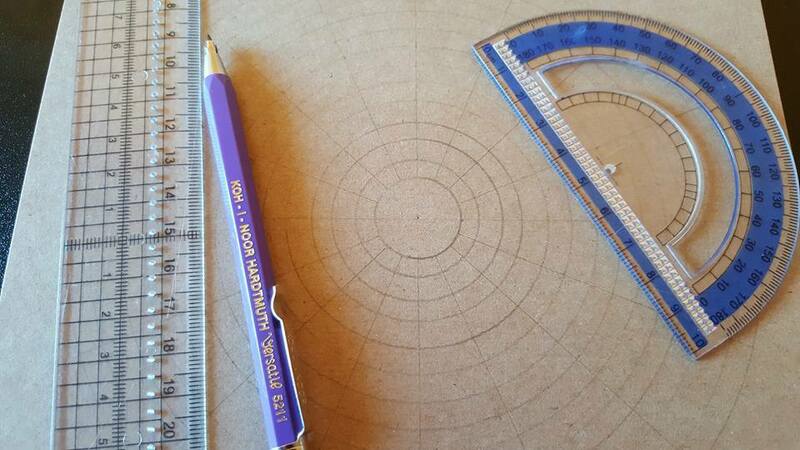 Step 1: I measure the center of the paper (or otherwise mark where I want the center of the mandala to be) and use the compass to draw a series of expanding circles. Draw them as near or as far apart as you want. 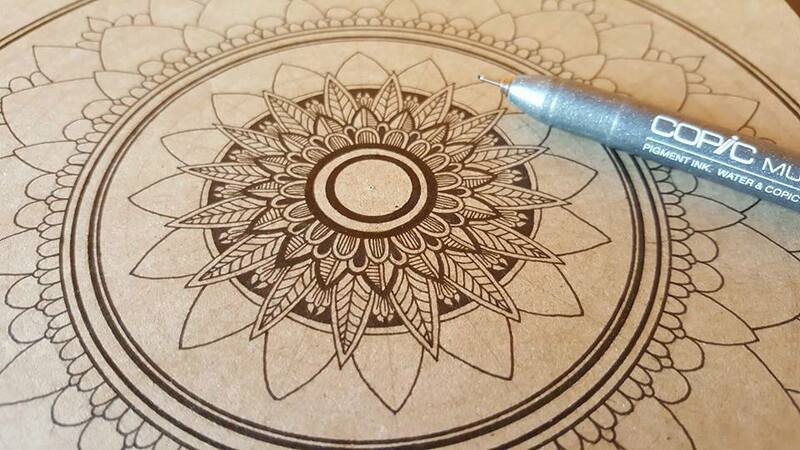 Step 2: Many mandala artists are so proficient with drawing their shapes consistently that they don’t need to do this step. I am unfortunately not one of them. 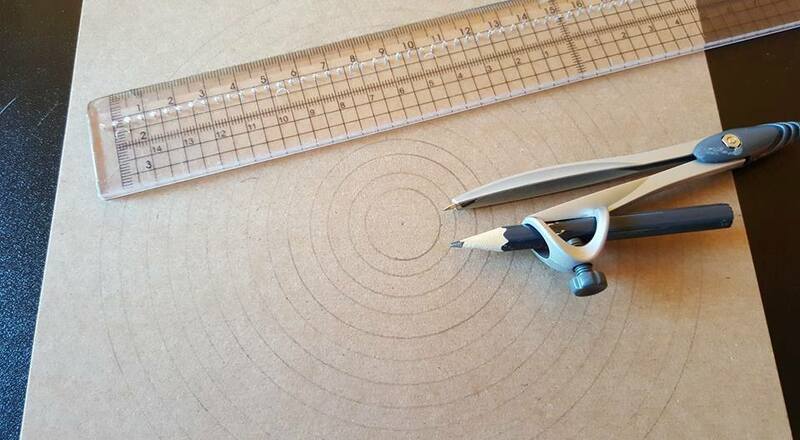 I use a protractor to slice my circles into equal segments. I usually break mine up into 16 slices but the count doesn’t matter. Step 3: I outline the shapes and build up the basic components of the mandala that I will later fill with detail. I don’t always do them like this – sometimes I draw the details in as I go along. Again there’s no right or wrong – you can use whichever method you prefer. I also do this in pen straight away but if you’re not feeling confident about that it’s perfectly fine to pencil your shapes first. Step 4: Details! I go back to the beginning and start filling in the shapes, one round at a time, with details. You don’t have to do one round at a time – sometimes it helps to do one cluster of shapes across several rounds to see how it’ll look. I also do this in pen straight away but again you can pencil your shapes first if you prefer.